We just love these Thai rice noodles and we have been cooking them with every opportunity that we get. This is my version loosely based on our two favorite Thai Noodles, the Pad Thai and Pad See Ew. The Yard Long Beans were from our garden. Which makes me now itch to get back there and start planting! Yard long beans, if you didn’t know, are also known as asparagus bean, Chinese long bean, garter bean, snake bean, and in the Philippines, we call them Sitaw. You can cook them pretty much anyway that you would a regular green beans, but they have a distinct flavor that is just unforgettable. 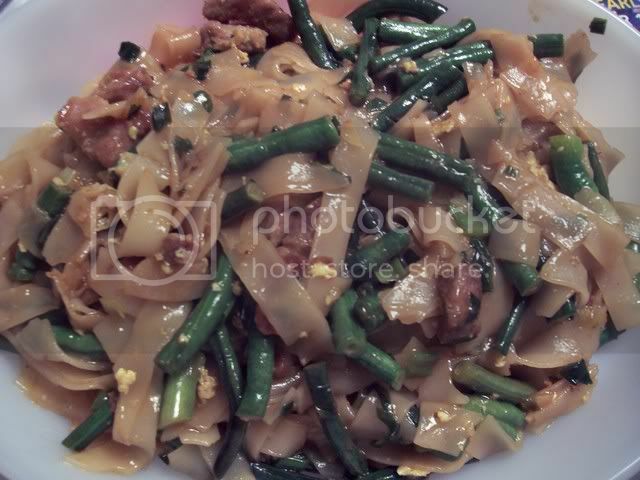 This is a stirfried noodle and vegetable dish that is loosely based on the Pad Thai/Pad See Ew recipes. Soak the rice noodles in warm water until they get soft and drain. Don't let them sit in the water too long. Marinade the meat in oyster sauce, soy sauce, sesame oil and red pepper flakes. Set aside to soak until you're ready to cook. While noodles are soaking and meat is marinating, get all your other ingredients ready as things will go really fast once you start cooking. Heat your wok on high until it is smoking. Add a tablespoon of oil and add the onions and garlic. Stir for about a minute until fragrant. Add the green beans and stir fry for a couple more minutes until the beans turn to a bright green color. Transfer everything to a plate or bowl and set aside. Let the wok heat up again and put a couple more tablespoons of oil to heat. Once it's smoking hot, add the meat along with its marinade and stir fry until all the liquid is absorbed and the meat is cooked through. A little bit of charring is a good thing. Push the meat to the side of the wok and if needed, add another tablespoon or so of cooking oil into the wok. Crack the egg into the hot oil and quickly stir it around until it is set, then stir together with the meat. At this point, add the noodles and the cooking sauces (oyster sauce and soy sauce) and stir it around until it is well mixed. Add a splash of broth or water if it seems that the noodles are clumping to loosen them up. Stir fry until the noodles are heated through. Add the vegetables back in and toss with the noodles. Stir fry for another minute or two until the vegetables and noodles are to your desired doneness. I like them on the crisp and al dente side, so I don't usually cook for more than a minute more.